General Electric stakes its business on innovation. But GE's engineers and lab scientists aren't the only ones with their imaginations at work. Marketers for the nearly 125-year-old conglomerate are experimenting with new ways to communicate with their audiences — namely those who are tech-savvy, science-loving, and Millennial. "We try very hard to just pay attention to what our audience or community is already doing — how they're already communicating," says Sydney Lestrud, global brand marketing manager for General Electric. "We look at the platforms or social channels where they already are or where they're tending to migrate to. So for us, we are always very interested in what's next and what's around the corner." Lestrud says one of the best ways to know the next big marketing trend or shift is by following budding generations, like Gen Y. "A lot of the time, we tend to really focus on a younger generation — the Millennial audience — who sort of lead the way in terms of where a lot of our communication goes," Lestrud says. "It's really keeping our finger on the pulse of where people are naturally communicating." For Millennials, there's a new standard of communication—the emoji. And it's a form of messaging that's organic to mobile and social media—two channels that dominate Millennial time and interactions. "Emoji are changing the way we communicate; they're becoming more important in our everyday language, particularly as messaging apps continue to grow," Lestrud says. "Emojis are a huge part of that — how we express ourselves; how we express our emotions. So we really saw emoji as an increasing trend. It's inspiring and fun. [We thought] it would be a unique and impactful way to communicate to a younger audience." So, marketers at GE set out to excite young people about the venerable brand, inspire the next generation of techies and scientists, and participate in existing conversations. Last winter, GE launched Emoji Science, then released its Emoji Table of Experiments, and created a Web series that features TV scientist Bill Nye — all of it part of a campaign that uses emojis to explain complicated science concepts. 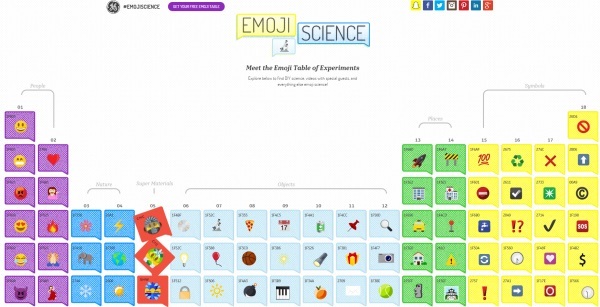 This month, marketers for GE added to their periodic table by introducing new Emoji Science superheros to coincide with Comic-Con International in San Diego. The new emoji characters — Carbon Fiber Crusader; Captain CMC; and Super (Hydrophobic) Woman — each represent super materials made by GE in their innovation labs. Those materials are often lighter, stronger and more resistant than more widely used materials — something that marketers at GE want to underscore with emoji marketing. Each emoji superhero is easily downloadable with the imoji app, is organic to the Comic-Con chatter, and serves as fun tools for Bill Nye to explain material science with emoji in all of his recent videos for GE. Lestrud says emoji marketing has allowed GE to tell its story of material science in a way that excites young audiences and taps into existing cultural movements. Simply put, it adds a cool factor. "We've seen a really great response," Lestrud says. "Not only through the audience that we were expecting, which was this younger generation of science and tech fans but from educators that teach K through 12 and museums. We added value to their missions." As for marketing wins, Lestrud says there are several. "Usage and views are up. We're aligned with different cultural movements. We're able to enter conversations in a natural way. We're getting people to lean into new technologies from GE," she says. And Lestrud says that, for the foreseeable future, emoji science is here to stay. "We've been really happy with Emoji Science, and we certainly plan to continue with more chapters later this year," she says. "It's now a part of our evergreen programming because we've been very happy with how it's been performing. It's a great way to get people excited." This article first appeared on dmnews.com. What really is the future of video?